From the beginning of his collegiate career at the University of Colorado-Colorado Springs to his sole season at the University of Colorado, Derrick White has proven that there’s little he can’t do. Now he’ll get a crack at showcasing those skills in the NBA with the San Antonio Spurs. Coming out of Legend High School in Parker, Colo., nobody in Division I basketball even batted an eye White’s way. He was undersized and needed to work out some kinks in his game, but he never shied away from hard work. Back then, all his parents could really hope for was a shot. Fast forward five years, to draft night 2017. White had worked out for 13 teams around the league leading up to the big night, and it was all coming to fruition. Then, he got a call. Although the draft was a few days ago, Derrick is still coming down from the high as he heads to San Antonio to get to work. From underdog to dark horse, Derrick is living proof that if you work hard enough, you can, in fact, achieve your dreams. He is the American dream, embodied. Given the proximity to a friend and just the West in general, his mom was elated with how the selection turned out. 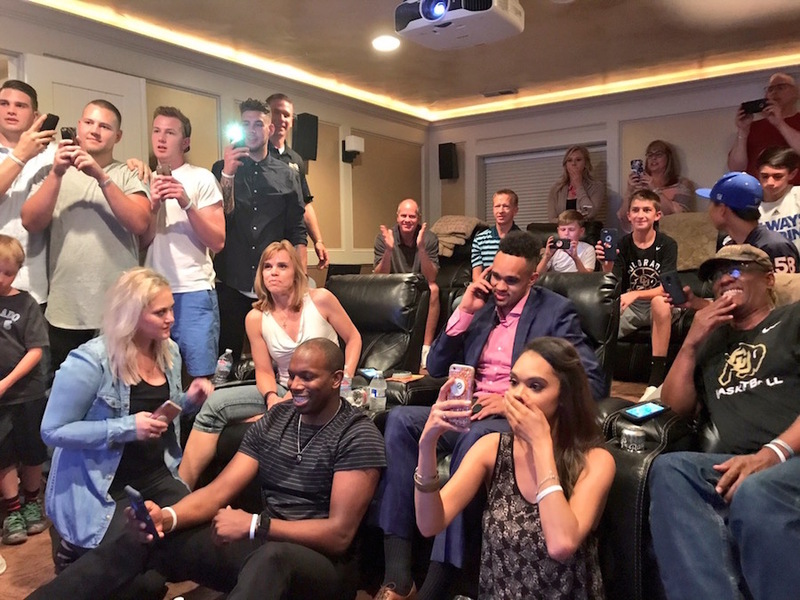 Derrick, now in San Antonio, will have the task of picking his official team number prior to heading to Utah and Las Vegas for Summer League. Right now, he’s thinking No. 4 will be the best fit for him, but he’s open to a few other options. Although Derrick said he looks forward to learning from all of his new teammates, there are a few players he looks forward to playing alongside a little more. “I’m excited about everybody there, but Kawhi [Leonard], it would be cool to play with him, Pau [Gasol], and the whole team,” Derrick said. Richard, for his part, thinks that Mr. Leonard is a shining example of what could be to come of Derrick’s NBA career, possibly. The versatility shouldn’t be a problem for Derrick at the next level, because from the moment he started playing the game back in the day, he’s been very coachable in ever sense of the word, and a completely unselfish teammate. Colleen thinks that while that trait may have, in some way, hindered his career in college, it will help him excel at the next level. Derrick started from the bottom, now he’s here.